Wednesday January 30, 2019-Garissa MP and National Assembly Majority Leader, Aden Duale, has rubbished the alleged growing rift between President Uhuru Kenyatta and his Deputy, William Ruto. Speaking during an interview yesterday, Duale laughed off claims that Uhuru could have changed his mind on endorsing Ruto as his successor in 2022. He noted that Uhuru remains committed to his initial promise to back the DP Ruto in 2022, a promise he has reiterated, though in private. "Uhuru has told us in a parliamentary group meeting that he will personally spearhead Ruto's campaign in 2022. In private, he has told us not once or twice that he will do it," said Duale. "Uhuru has said that we have a social contract with the people and must deliver on his manifesto and the Big 4 agenda. Whoever says he has change tact is wrong. You don't expect the president to declare his plans in a political rally" he added. 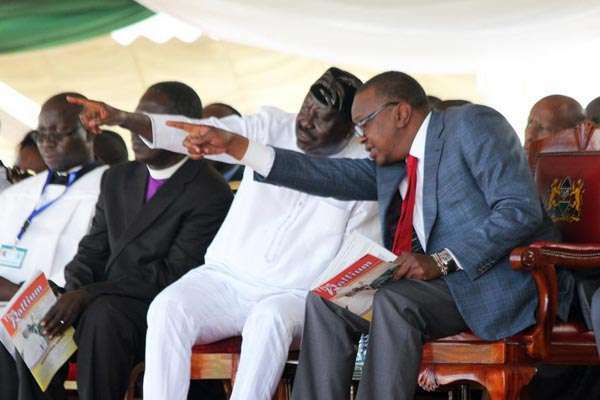 However, Uhuru’s alleged sentiments may break the so called ‘handshake’ if former Prime Minister Raila Odinga gets wind of what the President said about Ruto; the man he hates with passion, and the 2022 elections.